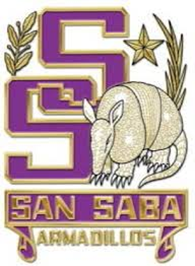 The State-ranked San Saba Armadillos (now 11-0), District 7 Champs in 2A-1 Region II, won their Bi-District Playoff game Thursday night 67-8 over Italy. San Saba is now ranked at number 3 in the Texas 2A-1 Division by at least one poll. Nearby Mason is currently in the number 1 spot and Carlisle is number 2. Out of these top three teams you have to believe there will be a fight for the state championship. This week Mason will meet 8-2 Weimar and Carlisle will meet 9-2 Joaquin, while San Saba will have what should be an easier game against 5-5 Valley View. Look for San Saba to keep going. We think?